China on Tuesday accused Indian troops of "crossing the boundary" in the Sikkim section and demanded their immediate withdrawal, while asserting that it has shut down the Nathu La pass entry for Indian pilgrims travelling to Kailash Mansarovar because of the border standoff. "We have lodged solemn representations in Beijing and New Delhi to elaborate on our solemn position," Chinese Foreign Ministry spokesman, Lu Kang told a media briefing in Beijing. "Our position to uphold our territorial sovereignty is unwavering. We hope the Indian side can work with China in the same direction and immediately withdraw the personnel who have overstepped and trespassed into Chinese border," he said. About the fate of the pilgrims headed to Kailash and Mansarovar, who had returned to Gangtok after denial of permission by China to enter Tibet, Lu said their visit was called off because security reasons. He also linked future visits of pilgrims to India "withdrawing the troops" from the area. "As to Indian pilgrims' journey through Nathu La pass at Sikkim section, I think the Indian side is very clear about this. For a long time Chinese government has made enormous efforts to provide the necessary convenience to those Indian pilgrims," Lu said. "But recently the Indian border personnel trespassed Chinese border to obstruct our construction, we have taken necessary actions. Out of security consideration we have to put off the pilgrimage by the Indian pilgrims through the Chinese pass," he said. Chinese Foreign Ministry spokesperson Geng Shuang on Monday said, "China urges India to immediately withdraw its border guards that have crossed the boundary and have a thorough investigation of this matter." "The Indian border guards crossed the boundary in the Sikkim section of the China-India border and entered the territory of China, and obstructed normal activities of Chinese frontier forces in the Donglang area recently, and the Chinese side has taken counter-measures," he said in a statement. His statement came after the Chinese defence ministry accused the Indian troops of objecting to building a road in what it claimed to be Chinese territory. Chinese defence ministry spokesman Ren Guoqiang said that recently China has begun the construction of a road in Donglang region, but was stopped by Indian troops crossing the Line of Actual Control. China urges India to respect boundary treaties and China's territorial sovereignty to maintain peace and stability at the China-India boundary, Geng said. On Monday, Geng had also said that the foreign ministries of both the countries were in talks over this issue. The Nathu La route, which is the second route for the Kailash yatra, was launched with fanfare by the two countries in 2015. Till 2015, the yatra was being organised by External Affairs Ministry only through the Lipu Pass in Himalays connecting the Kumaon region of Uttarakhand with the old trading town of Taklakot in Tibet. 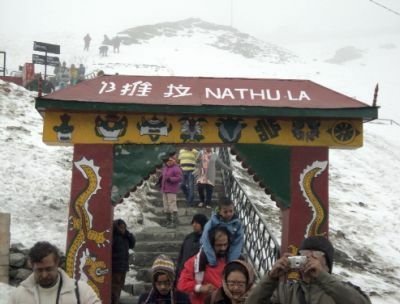 The route through Nathu La reduced the hardship and journey time enabling many more pilgrims, in particular aged pilgrims, to undertake the yatra.